There is a lot to like about robotics as a means of automating DCs. The tricky questions around robotics are not will they catch on, because they are, but what types of robotics will best suit an operation, and how will they interact with traditional automation and human labor? 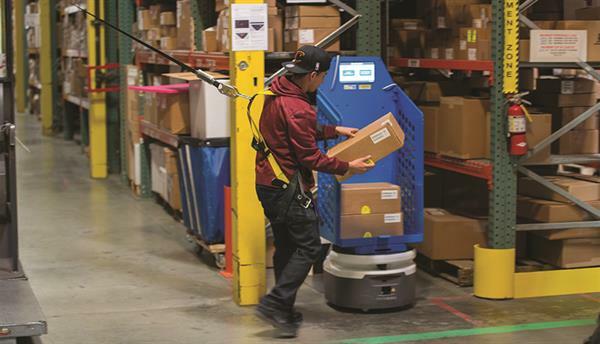 If you wanted to create the perfect mix of conditions to trigger the growth of a type of automated equipment for distribution center operations, you couldn’t do much better than the factors lining up in favor of robotics. E-commerceand omni-channel fulfillment are driving labor-intensive piece picking, and warehouse labor is increasingly difficult to find and retain. DC operators know they need to automate to reduce these challenges, but few operations are able to plunk down millions for traditional automation projects that carry long payback times and might be difficult to reconfigure. Enter a new generation of robots, based on technology that uses on-board sensors and a more “natural” approach to navigation. Research shows high interest in robotics. According to MHI’s “2018 Annual Industry Study”, 65% of professionals surveyed now see robotics and automation as a major source of disruption and/or opportunity, up from 61% last year. While e-commerce has increased piece-picking requirements, robotics also has evolved rapidly, with less reliance on guidance infrastructure like tape, and more use of smart, on-board navigation. The AMR term has emerged to describe this self-driving nature. 3PL RK Logistics is using Fetch Robotics’ AMRs for materials transport. The robots eliminate labor hours consumed pushing goods on a cart. What different types of robotics exist for DCs, and what sort of workflows do they support? How do these robots coexist with human labor and more traditional forms of automation? Besides the “bot” itself, what other factors are involved in selecting robotics? Using automated vehicles for materials handling isn’t new, as automatic guided vehicles have been used successfully in factories and warehouses for decades. But the traditional AGV was reliant on tape or other guidance markers, says Melonee Wise, CEO of Fetch Robotics, which offers AMRs. With AMRs, she says, “autonomous” is the key word, whereas with most AGVs, “guided” is the operative word. The main role for Fetch’s AMRs is material transport, moving goods long distances so that a human doesn’t have to do so by pushing a cart or by driving a vehicle. In other cases, AMRs can function like conveyor. Wise says most customers can get ROI in nine to 12 months with Fetch’s AMRs, while their flexibility makes them appealing to 3PLs. Fetch’s customers include 3PLs such as RK Logistics. Software from 6 River Systems sends a robotic “Chuck” to an aisle where a human picker badges into the robot and follows it to pick goods from an aisle using the Chuck’s lights, display and scanner to guide and confirm the work tasks. Mobile robots differ in the workflows they do. Some focus on material transport. Others function as “goods-to-person” systems in which mobile robots transport shelves that hold goods to a light-directed, ergonomic picking station where a human does the picking. 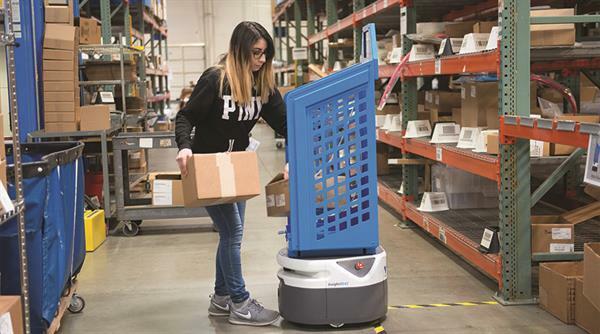 Yet another category is robotic-assisted cart picking in which the AMR has integrated features such as visual display, put lights, or a bar code scanner. 6 River’s software can integrate with a warehouse management system to get order information, and with that data, it figures out the most efficient work assignments for each robot or “Chuck” as they are called. The software then sends a Chuck to an aisle where a human picker badges into the robot and follows it to pick goods from an aisle using the Chuck’s lights, display and scanner to guide and confirm the work tasks. “We actually lead the associates through their work, making it a directed workflow and paced environment,” says Dubois. A key advantage to robotic-assisted cart picking is that it’s easy for new workers to learn, says Dubois. “Each Chuck is physically leading you and telling you what to do, so from a training perspective, and from the user’s perspective, it’s an easy environment to work in, he says. IAM’s units have been deployed at companies including Rochester Drug Cooperative. A recent twist on IAM Robotics’ technology is the Swift Picking Module, which functions like a flexible automated storage and retrieval system (AS/RS), but rather than being an enclosed storage infrastructure with an enclosed crane or other movement mechanism, it uses IAM’s mobile manipulation robots and an open shelf environment. The major advantage of a mobile manipulation robot, says Reed, is that it automates both movement and picking/transfer of goods. “We see that the industry is looking for a more complete solution [for the labor challenge] and that’s what we are answering,” he says. Robotics picking arms are using artificial intelligence (AI) and new gripper designs to make them better suited to piece picking. While various means can be used to present work to a robotic piece-picking station, a fairly new twist is using robotic arms in combination with goods-to-person automated systems such as shuttles, in what might be termed a “goods-to-robot” setup. Swisslog’s parent company KUKA Robotics offers smart, collaborative picking robots with sensors that allow them to be operated safely near humans without being fenced off. These picking arms could work in concert with one of Swisslog’s mini-load solutions in which the system would present goods to the picking robot. “The key advantages are that the automated cell can run 24/7, and the accuracy is higher [than with a human picker],” says Henriksson. Robotics vendors have also partnered up to more fully automate processes. For example, Vecna Robotics, a vendor of AMRs and zero-infrastructure AGVs, recently partnered with RightHand Robotics, a provider of robotic picking solutions, to combine Vecna’s autonomous mobility with RightHand’s autonomous piece picking. At the 2018 Modex show, Righthand’s “RightPick” work cells successfully picked and placed more than 131,000 items during the show. Machine learning software within RightPick is the key to being able to pick a variety of items, along with the gripper design, sensors and vision technology on the bot. Leif Jentoft, co-founder of RightHand, says in the Modex demo, the mix of items spanned bottles, boxes, blister packs, bags and even people’s shoes and wallets. With machine learning, RightPick is constantly gathering data on what works best for grasping different types of items without having to train the system on specific items. There are some limits to what a robotic picking arm can handle. A small robotic arm and gripper designed for piece picking into a tote, for instance, isn’t going to be able to pick a large heavy box that contains a product like a lawnmower. Robotic piece picking is an interplay between the software smarts that perceives how to grasp items, the gripper’s charactistics and capabilities, and issues like weights and dimensions of items you need to move, explains Herbert ten Have, CEO of Fizyr, a vendor that offers deep learning software to enable robotic picking. Fizyr’s software and technology focuses on the perception part of this challenge—knowing how to best grasp any object the robot sees. Fizyr works with automation providers who apply its deep learning software within their solutions. Combining shuttles with robotic piece picking is a high-growth opportunity for Fizyr, says ten Have, in part because the variety of items to be handled offers a more “controlled environment” than the nearly limitless variety of items that might move through a postal DC, where Fizyr’s technology also has been used. While AMRs will reduce human labor requirements, and in some cases might take the place of conveyor, it’s not as though robots will totally replace people and traditional equipment. In some cases, notes Fetch’s Wise, its AMRs are used to transport goods coming out of vertical lift modules (VLMs), while allowing associates to focus on other tasks besides transporting goods. Automating a warehouse with AMRs, mobile manipulation robots or picking arms involves multiple factors besides the look and movement of the bot itself. These include the software the vendor uses for task management, fleet management and integration, as well as industry experience. 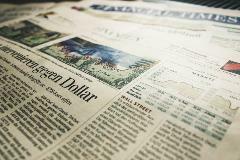 Potential users also may be able arrange leasing or a “robotics-as-a-service” payment model. “Historically, we could not find leasing companies that would service a lease, but the last two years, the market has exploded for leasing,” says Hayes. Kenco Innovation Labs’ Ehrlich says Kenco has not yet deployed AMRs, but certainly sees the potential and is studying the various types available, the workflows they can support, and additional factors such as vendor experience, integration mechanisms to host systems, and software functions in areas like order processing and batching, or fleet monitoring.